Production: GPO Film Unit for Ceylon Tea Marketing Board, begun as an Empire Marketing Board film; black and white, 35mm; running time: 40 minutes. Released 1934. Filmed in Ceylon. Producer: John Grierson; screenplay: John Grierson, Basil Wright, and others, based, in part, on a book about Ceylon written by traveller Robert Knox in 1680; photography: Basil Wright; editor: Basil Wright; sound supervisor: Alberto Cavalcanti; sound recordist: E. A. Pawley; music: Walter Leigh; the "voices of commerce" heard in the sound track montage: John Grierson, Alberto Cavalcanti, Stuart Legg and Basil Wright. Cast: Lionel Wendt ( Narrator ). Grierson, John, Grierson on Documentary , edited by Forsyth Hardy, London, 1946; revised edition, 1979. Wright, Basil, The Use of Film , London, 1948; reprinted 1972. Lovell, Alan, and Jim Hillier, Studies in Documentary , London, 1972. Barnouw, Erik, Documentary: A History of the Non-Fiction Film , New York, 1974. Wright, Basil, The Long View , London, 1974. Sussex, Elizabeth, The Rise and Fall of British Documentary: The Story of the Film Movement Founded by John Grierson , Berkeley, 1975. Ellis, Jack C., The Documentary Idea , Englewood Cliffs, New Jersey, 1989. Wright, Basil, "Filming in Ceylon," in Cinema Quarterly (London), Summer 1934. Greene, Graham, in Spectator (London), 4 October 1935. McManus, John T., in New York Times , 16 August 1937. Variety (New York), 18 August 1937. Tallents, Stephen, "The Birth of British Documentary," in Journal of University Film , nos. 1, 2, and 3, 1968. Sussex, Elizabeth, "Cavalcanti in England," in Sight and Sound (London), Autumn 1975. Starr, Cecile, "Basil Wright and Song of Ceylon, " in Filmmakers Newsletter (Ward Hill, Massachusetts), November 1975. Cinema d'Aujourd'hui (Paris), February-March 1977. Gerstein, Evelyn, "English Documentary Films," in The Documentary Tradition , edited by Lewis Jacobs, 2nd edition, New York, 1979. Fredrickson, D., "Jung/Sign/Symbol/Film," in Quarterly Review of Film Studies (Pleasantville, New York), Fall 1980. Jayamanne, L., "Image in the Heart," in Framework (London), no. 36, 1989. Rodrigo, A., "Do You Think I Am a Woman, Ha! Do You?" in Discourse (Detroit), no. 11, Spring/Summer 1989. One of the finest achievements of the British documentary movement was Basil Wright's Song of Ceylon , which has been called the world's finest example of lyrical documentary. The film's theme, as its producer John Grierson described it, is "Buddhism and the art of life it has to offer, set upon by a Western metropolitan civilization which, in spite of all our skills, has no art of life to offer." Graham Greene, reviewing the film when it played as the second feature in a London art theatre, described it as having an "air of absolute certainty in its object and assurance in its method." He singled out shots of birds in flight as "one of the loveliest visual metaphors I have ever seen on any screen." Wright later said that he had seen the birds at the end of a day's shooting, when the light was practically gone; he made his assistant unpack the cameras and get out the telephoto lens, though at the time he had no idea how the shots would be used. Wright had been sent to Ceylon to film four one-reel travelogues as publicity for the Ceylon Tea Propaganda Board, but that purpose soon gave way to an "inner impulse" that made him film other sites and themes. In practical terms, he did not realize he was filming Song of Ceylon until he was back in London and had the material on a cutting bench. There was no shooting script for the film, and Wright could not screen his rushes in Ceylon. Without air transportation, it took a month just to get reports on the footage he had shot. Wright worked with one assistant, three cameras and two tripods, one of which had a finely balanced free-head which he found tricky to use but once mastered was capable of very delicate movement. This permitted some of the most remarkable panning shots ever made in film, an art he had learned from Robert Flaherty a few years earlier. The editing and sound in Song of Ceylon were done in England. Composer Walter Leigh created and recorded every effect in the film as well as all the music. Combining as many as eight tracks was both difficult and costly on the primitive equipment available to documentary filmmakers in the mid-1930s; at that time, sound was developed and edited on film, not on tape. window. 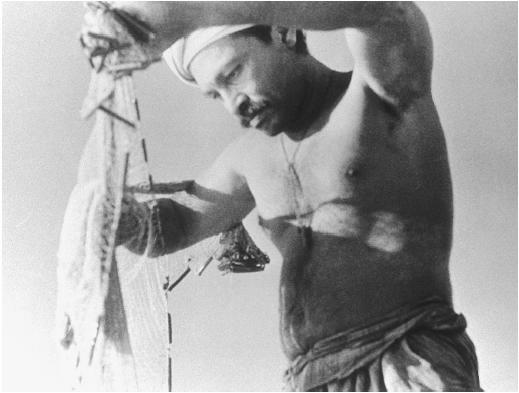 At the last minute, Wright inserted four titles which prescribes the film's symphonic structure: "The Buddha," "The Virgin Island," "Voices of commerce," and "The Apparel of the Gods." The first section, extremely slow, follows pilgrims up a mountainside to pray. The second shows the daily life of the people. "Voices of Commerce" juxtaposes two systems of labor, with the sound track ironically quoting British stock market prices and the arrival and departure times for ships while Ceylonese natives gather coconuts and tea leaves by hand. The last section returns to the religious and cultural life as it had been lived by the Ceylonese people centuries before the arrival of the British. Not everyone responded favorably to the film's poetry and beauty. Variety 's reviewer called Song of Ceylon "a shade too arty," despite its "splendid camera work." John T. McManus, in the New York Times , attributed the film entirely to John Grierson (without mentioning Basil Wright's name) and seemed bothered by what he called the film's "basic aloofness." He objected not so much to the film ("beautiful job. . . striking in photographic values. . . painstaking in composition and montage") as to its approach. "It certainly deserves the prizes it has won, but there are prizes it could not win," McManus concluded. The same could be said, however, for any film which, like Song of Ceylon , is one of a kind. Basil Wright summed up his feelings about the film in this way: "I think Song of Ceylon is the work of a young man exposed for the first time to an oriental as opposed to occidental way of life, and to a very impressive and convincing oriental religion . . . . Without any question it's the only film I've ever made that I can bear to look at." Wright directed or co-directed some 25 other documentaries (including the celebrated Night Mail , with Harry Watt, and World without End , with Paul Rotha). He was also author of many film articles and reviews, as well as two books— The Use of Film and The Long View .